Many people love the idea of making extra money but think it’s impossible to make extra money on the side. Learning a new skill is a great way to make more money. You may wonder which are the best skills to learn to make money and if it’s difficult to learn those new skills. Thankfully, that’s not the case. There are many resources available that can help you learn a new skill to make money on the side and in many instances, those resources are free or relatively inexpensive. If you want to find the best skills to learn to make money online or in your job, this post will give you some ideas to get started on making extra money. The reason why doesn’t really matter. However, when you tie the act of earning extra money to a goal it encourages you to continue to reach your goal. You don’t want to limit yourself when trying to find ways to supplement income. When you find skills to learn to make extra money, you open up new income producing possibilities that can not only assist you in the short-term, but also help your long-term financial health. As you’ll notice below, not all of these skills to learn to make money are career-related. Some of them are financial in nature. Both are equally important to help you make more money on the side and improve your financial standing. We’ll first cover a couple of the financial skills to learn to make money. Master these and you’ll be surprised at how you can grow your money. Hands down, the best way to find more money is to learn how to budget. There are many different ways to budget. You can use a financial app like Tiller or Personal Capital to help you keep track of your spending or you can use the envelope budget system to track everything with cash. When you budget, you start paying attention to your spending patterns, your habits, and you notice when a company accidentally overcharges you or raises your bill without letting you know. All of this will help you to make more money because you will be much more aware of where your money goes. If you’re new to budgeting, check out our guide on how to make a budget to find the steps needed to find a budget that will work for your needs. Many people think investing is too complicated for them to learn but that’s just not the case. Investing is relatively simple. The investing world just likes to use a lot of complicated terms. Thankfully, there are many free resources that help you learn how to start investing in the stock market. Many online brokers offer free tools and courses to help you learn and many 401(k) plans offer similar resources. Take your time when it comes to investing and educate yourself so you can be comfortable with what you’re doing. Once you start learning, you’ll realize that investing in the stock market is one of the best ways to make money for the long-term, especially when it comes to the power of compounding interest. Negotiating is a skill. The most important thing you will ever negotiate is your salary. Here’s how to negotiate and make more money at your job. It’s best to negotiate for a high salary right when you’re hired. This makes it easier to negotiate for raises along the way. When you negotiate, you are essentially helping yourself make more money without adding degrees or specific skill sets. Still, skill sets are important, too. Let’s look at few examples of skills that can earn you extra money at your job and online. It’s no secret that coders and programmers are in high demand in today’s tech world. Much like finances, though, anyone can learn these skills. While you once had to get a degree, now you can take boot camps that allow you to learn programming languages in a few months and get hired quickly. If a coding boot camp sounds too overwhelming, you can take coding courses on Udemy. Udemy regularly has courses for as little as $10 and you can find many courses that fit your comfort level, from beginner courses to more advanced ones. Writing is definitely a talent but it’s also a skill you can grow and develop. Like many things, the more you practice when it comes to writing, the better (and faster) you’ll get. You can take different courses online to become a better and faster writer. You can also take courses that are specific to freelance writing which can help if you’re wanting to work as a stay-at-home mom or work in a corporate job. Writing and communication skills are valuable in the 9-5 workplace. If you combine your writing skills with other skills, like coding, you could be valuable to an employer as a content manager or brand manager. Moving up in your career or switching careers to a more lucrative one can definitely increase your income. Another skill to learn to make money online is graphic design and image editing. Again, if you can learn a skill and apply it to technology, that is valuable in today’s workplace. Most large companies need graphic designers and image editors for their websites. As with coding, you can often find inexpensive courses to help you master this skill. Additionally, if you’re already a graphic designer, you can take a boot camp to learn how to become a User Interface Designer. UI designers work to help improve the look and feel of websites and apps to make things easier for customers and consumers. Think about how easy it is to use an iPhone and how intuitive it is. A UI designer, along with a team of developers, would help with projects like that. Ultimately, there are many ways to make more money by learning new skills. You can learn all of the skills listed above in just a few months. Some of them, like tech skills, can translate to earning much higher salaries after you’ve learned and mastered those skills. If you’re not interested in learning career skills, simply learning financial skills like investing and budgeting can help you on your journey to earn more. What are some other important skills to learn to make money? What’s one career skill you’d like to learn but think is impossible? What’s one financial thing you want to accomplish this year? 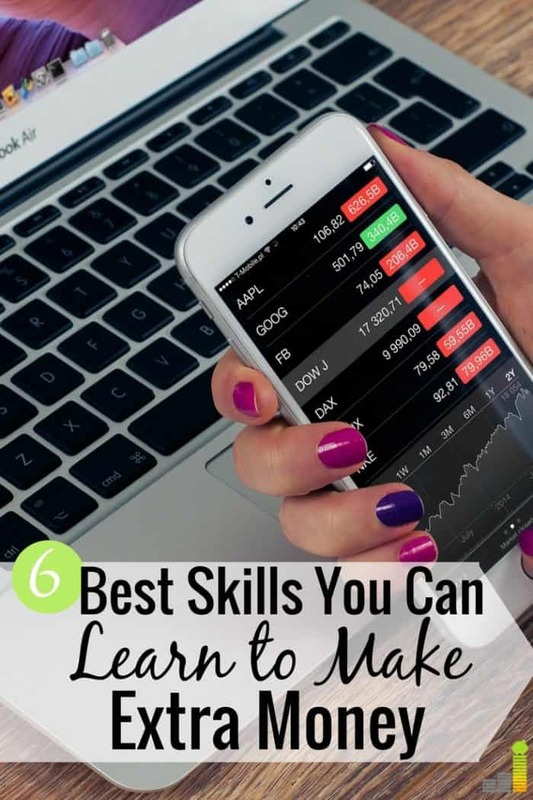 The post 6 Best Skills To Learn to Make Money That Anyone Can Do appeared first on Frugal Rules.